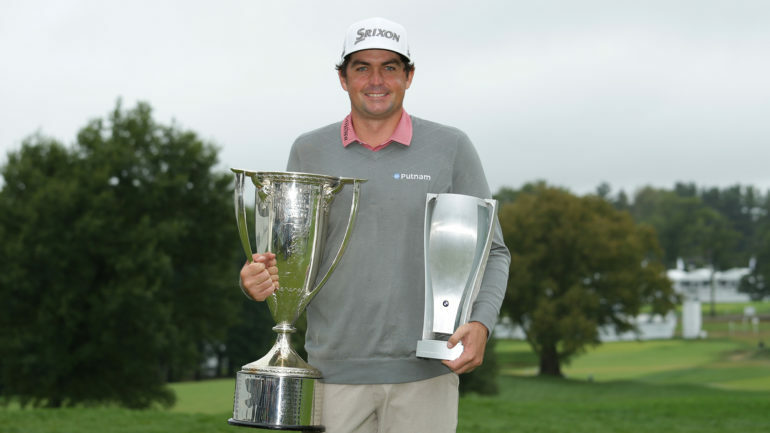 NEWTOWN SQUARE, Pa. – Keegan Bradley held off Justin Rose in a sudden-death playoff to win the rain-plagued BMW Championship on Monday for his first PGA Tour victory in six years. Bradley, who shot a final round 6-under 64 to finish at 20-under par, thrust his arms toward the grey sky and drizzle in celebration and waved his family onto the 18th hole. He tossed into the air his young son, Logan, who hadn’t even been born in 2012, the last time Bradley won on the tour. Canadian Adam Hadwin finished T19 at 12 under par. The Abbotsford, B.C., native is projected to finish 36th, outside the required top-30 to advance to the TOUR Championship from Sept. 20-23 at East Lake Golf Course in Atlanta, Ga.
Woods caused some more noise – he’s been doing that a lot in recent months before the largest galleries at every course – and got within one shot of the lead when he made birdie on No. 9 to go out in 31.